The article (http://www.uqar.ca/files/biodiversite-nordique/Samsonetal2011GEB.pdf) is essential reading for educators who want to present this map. 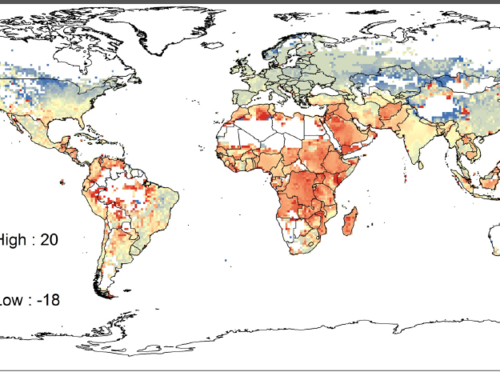 Map uses the relationship between the distribution of human population density and climate as a basis to develop a global index of predicted impacts of climate change on human populations. The data sources are included in the article. The map uses the acronym - CDVI - that refers to the climate demography vulnerability index developed in the article. Challenges the notion that the areas of highest climate change impact on human populations would be the same as the areas of highest climate change impact measured in biophysical terms. To understand this point, however, the educator will have to be familiar with the methodology used to produce it. The kinds of analysis required to produce this map are not apparent from the map itself. Comments from expert scientist: Impact of climate change on human population is certainly an interesting topic. However this material is not sufficient to be used as a standalone teaching material. This is a provocative map - challenging the notion that the areas of highest climate change impact on human populations would be the same as the areas of highest climate change impact measured in biophysical terms. To understand this point, however, the educator will have to be familiar with the methodology used to produce it. The quality of the image in the pdf of the original article (http://www.uqar.ca/files/biodiversite-nordique/Samsonetal2011GEB.pdf) is higher than the one in the resource URL. Educators will need the original article in order to present this map. A highly specialized resource, with data missing in Sahara and Australia.